So what is this special formula for success, and what does it have to do with mind maps? In 30 years of teaching, Buzan has discovered that most people seem to think that the path to success – the “goal of goals” – is to get better with every trial. This is a deeply flawed formula, because it implies that we should progress in a linear fashion, and that errors, especially after many trials, represent heartbreaking failures. In other words, Buzan maintains that most people are wrought with the fear of failure, which ultimately translates into fear of success, because there can be no success without experiencing a certain amount of “failure” all along the learning path – a path that is everything but linear. This is why Buzan introduces his own formula for success, which is meant to mirror the way the brain works in learning and adapting to the universe: to learn with every trial. This formula acknowledges that learning is a complex process with a few ups and many downs, and with long periods when it seems like we are making no progress at all. It also puts errors is the proper perspective: they are the conduit for success or, conversely, success is the byproduct of our errors. This is where brainstorming and mind maps come back into the picture. Remember, the first phase of mind mapping is about quantity, not quality. The idea is to make many “errors”, so that amongst the plethora of (bad) ideas, a few good ones will emerge. By helping us produce errors faster, mind maps are a gateway to success. For example, when confronted with a problem, mind maps force our brain to come up with a range of hypothetical solutions, even wild ones, which could very well end up being the best ones. In writing, mind maps help us extract all the ideas we have consciously and unconsciously developed about what we are trying to write, including the absurd ones; and they also (fortunately!) help us prune those ideas so that the last draft contains only the best ideas, in an interconnected way (by looking at my mind map for this two-part post, you can see that I ended up dropping many ideas, because on second thought I felt they were either irrelevant or not very pertinent to what I wanted to focus on). I do however have a few critical remarks. Firstly, I’m sorry if I disappoint anyone, but there is no ultimate formula for success! Buzan rightly encourages us to view errors as milestones on our path to success, but there is absolutely no guarantee that persistence and error acceptance will bring all the results we seek. I think a more realistic way of looking at trial-and-error is… that too many failures should indeed be taken as a wake-up call: perhaps that goal we have set is out of reach, perhaps – let’s face it – we don’t have what it takes to succeed in a particular endeavor. I know from my own experience that sometimes my tenacity was foolish, and that it was a way of not admitting to myself that I didn’t have the talents or the skills for a particular activity or venture. How I wish I had realized sooner that this or that wasn’t for me! Like when I thought that mounting a hoop on my driveway and shooting free-throws everyday would make me a great basketball player… (yeah right!). Or that my hours and hours of guitar playing over the stretch of many years would yield to appreciable results, even though my fingers never managed to match the expectations of my musical soul. Realization of one’s limits, of one’s talents, strengths and weaknesses is as important as learning from one’s errors. To use a Stephen Covey metaphor, we have to make sure that “our latter isn’t leaning against the wrong tree”. Finding the right tree to climb is as crucial as climbing it. Secondly, mind mapping is a great tool, but like every tool we have to remember that it’s just a tool. Kipling’s beautiful poem “If” comes to mind: “If you can think, and not make thoughts your aim…”. It’s very easy to fiddle with mind maps, to use them as an excuse not to do actual work. At a certain point, it’s time to put that mind map down and start writing! 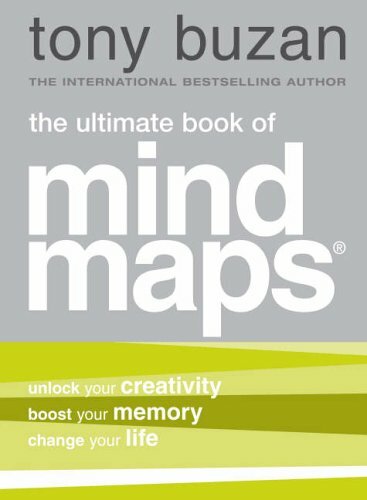 The Ultimate book of Mind Maps teaches one of the most powerful techniques for leveraging our creative potential. Buzan’s principles are now widely accepted, and more and more people realize that creativity is a function of quantity and that success a function of error and persistence. I personally swear by these principles and have incorporated them into my everyday life. Turning to a mind map is for me a standard reflex when I have to solve a problem, plan or write. It is however important to realize that there is no quick-fix or simple formula for success, and that mind mapping is only as effective as its user: it can be a great tool to increase our brain’s potential and discover great ideas and interconnections, but it can also become a “fidgety” exercise, a sophisticated excuse for not doing what you should be doing. The key is to use it in a disciplined way, without losing focus on the ultimate task at hand. My favorite way to mind map is on the Ipad, with Ithoughts HD, which I can pull out at any moment. When I am at a computer, I use MindManager, even though, when possible, I prefer to use the Ipad, because it feels more natural to create and rearrange ideas with my fingers. For a more complete discussion on incorporating mind maps into your lifestyle, I highly recommend David Sparks’ and Katie Floyd’s discussion on Mac Power Users episode 82: cooking ideas and David’s article for MacWorld: “From Brainstorming to Outlining”.